VtWProductions: No Excuses 2017 Rantathon! It's that time again. 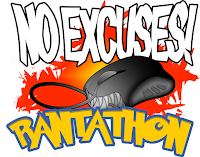 To belatedly celebrate 300 episodes and to end the year with a bang, It's the No Excuses 2017 Rantathon! What is a Rantathon? Simply put, the guys get on the air and cast until they can cat no more. with such a broad time anything can happen! Expect shenanigans, ranting, exhaustion related madness, ranting and possibly a bit alcohol along with the usual pleb-tier podcasting you've come to know and love tolerate. Join us for a night of fun, games, ranting and possible drunkenness. Our previous record is the rather ominous 13 hours, which we probably won't be breaking any time soon. You can get involved! Join us Live on Twitch and Discord to interact with the hosts and maybe join us for a game or two. Send us your emails at noexcusesvtw@gmail.com on any gaming, anime or geek related topic you like. Show us an interesting article, your own recent gaming exploits or tell us we're wrong about something. No topic is off limits!